It's only been done a couple of times before and only on long FG attempts anything over 50 yards where the ball falls short of the goal posts and didn't fall out of bounds.. It's totally legal but I am surprised it hasn't been attempted more often. We seen a lot of 50+ yards attempts: I would think every time a team tries to do a 50+ yards FG, the opposite team will put someone in the end zone. play itself I think it's a great idea to keep someone out there on long field goals. I would think they would put someone out there everytime there is a long field goal attempt of more than 50 yards. LOOKS like they won't be able to NOW with the rule now being that, on a missed FG, possession changes at the point of the FG attempt... teams will want to take the ball at that point... If you attempt to run it back out of your own endzone, you run the risk of being pinned back deep in your own end. For political reason, I refuse to support the NFL and watch anything maybe except for the Supebowl. The Tennessee Titans-Miami Dolphins game at Hard Rock Stadium has been suspended because of lightning in the area, the Dolphins announced. The game will resume once it's determined the threat of lightning has passed. The game was suspended with 1:52 remaining in the second quarter with the Dolphins leading, 7-3. It's just a few lightnings! They are wearing all that plastic protection and a helmet too made with plastic and foam padding. They are also all well grounded. Furthermore, your odds of being struck by lightning in a year are 1 in 960,000. In your lifetime those odds drop to about 1 in 12,000. Your odds of being struck by lightning twice in your lifetime are 1 in 9 million. Did they clear the stadium of all those 65,000 people? It makes no sense to suspend the game and send both teams and their staff to the locker room while the fans are still sitting in the stands and are still at risk of being hit by a lightning. Any team that beats New England is my new favorite team! Watching the NYJ vs CLE game. What is with all these new stupid rules? CLE WR drops a pass intended for him near the sideline. A NYJ defender picks up the dropped ball and hands it to him. The NYJ defender gets called for unsportsmanlike conduct which results in an automatic first down for CLE. CLE QB fumbles the ball while trying to avoid being sacked, a CLE lineman picks up the ball and runs it forward for 9 yards. The 9 yards gain is nullified because in minutes after a 2 minute warning, a fumble can't be return by the offense for yards gained unless it's the person who fumbled it that did the return. NYJ RB scores a TD. He throws the ball into the audience. He gets called for unsportsmanlike conduct and a 15 yards penalty is added on the ensuing kickoff. What kind of rules are these? Then you have all these new rules where you can't hit the QB pretty much in every which way (no using the helmet, no using the shoulder) or you will get called for roughing the passer or unsportsmanline conduct. How about the jet player throwing 2 touchdown balls into the stand, I heard it's a 5000 dollar fine. Cleveland Browns just won their first game in 635 days. I have been noticing the people on the sideline lately while watching the different NFL games each week. For example just now during the Saints vs Falcon game. They are not part of the officiating crew or the stadium crew. They don't look like reporters or news camera crew: I don't see any camera equipment. How did they get a spot to stand in the sideline. 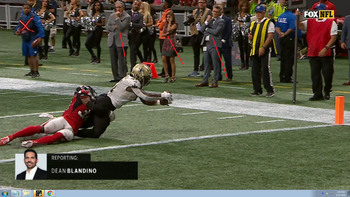 Earlier in the game there were 2 ladies in their 20's who were just standing there on the sideline near the end zone, and they were jumping up and down when the Falcon scored. I know you can get tickets to the private booths upstairs and to the seats. Do they now have tickets that you can buy that let you go stand on the sidelines? How did the defensive coordinator for the NE Patriots is now the head coach of the Detroit Lions? Watching Monday Night Football on ESPN. He is not one of the 2 announcers/broadcasters in the booth. he talks more than the 2 main guys in the booth that are calling the game. When it's 1st down and 2nd down and 3rd down and 4th down, the 2 guys in the booth are supposed to call the play as it happens on the field but NO!! 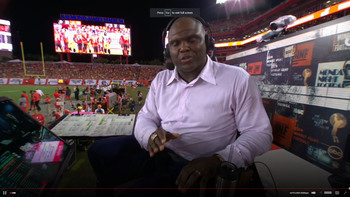 this annoying guy is talking on and on and on, over several downs and series and even talking over the 2 guys in the booth and interrupting them. He just can't freaking stop talking. He is supposed to stop talking when a play is snapped!! Of course there are more TD passes this year than last year. They made it that you can't no longer go after the QB without risking getting called for roughing the passer or unsportsmanlike conduct. These are the games for tomorrow and Monday. So far with this being week #5, looks like most teams are in the gutter or nearing the gutter. A lot of 1-3 and a few 1-2-1 and the rest of the teams are on pretty much same even footing. KC Chiefs and LA Rams. They squandered a 17-0 lead and let Cincinnati score 27 unanswered points to win the game. I can't believe the ending of the Carolina vs New York Giants game. With only 6 seconds left, the Panthers kicker kicked a 63 yards winning FG and his career longest was 54 yards! Same thing I said last week. Someone needs to start winning and break away from the pack. Most every other team is either at 1-something or barely 50% at 2-3 or 2-2-1. Keeps going like this, there will only be a handful of teams you can count in one hand in the playoffs if by the end of week 17, everyone else is ranked at 8-8 or 7-9 or 6-10 or lower. they have Lady Zebras in the NFL now!! I think she has been an NFL referee for a couple years now. According to WIKI, there are 9 of them. I guess the game to watch tomorrow is Sunday Night football matchup between the Kansas City Chiefs (5-0) and the New England Cheaters (3-2). Watching the start of the KC vs NE game. KC has the worse defense in the NFL and they are 5-0? How are they going to stop Tom Brady? Do like my Eagles did in our Super Bowl 52 win....if he scores a TD, score one back lol. You don't answer a Brady TD, game will slip fast. For a second there I thought KC was going to pull off a win at the last minute!! What a high scoring shootout!